A bride with lace sleeves and a groom in a grey vest cut their wedding cake at Meredith Manor in Pottstown, PA. Image is shot from a low angle with a wider lens so you can see more of the cake and surroundings. 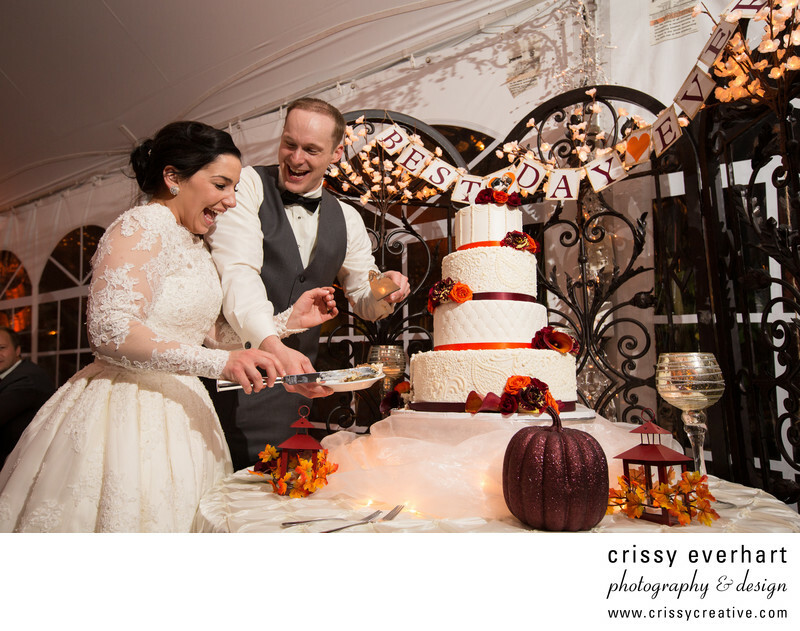 This wedding was the day before Halloween so they had a lot of fall colors and pumpkins. The cake is ivory with maroon and orange flowers and ribbons, and patterns in the ivory icing. A pennant sign saying "Best Day Ever" hangs being the cake table, which is decorated with sparkly pumpkins, lanterns, and candles. Location: 2270 Pottstown Pike, Pottstown, PA 19465.